Let’s kick things off this week with the biggest weekend of the year for one of our biggest customers. 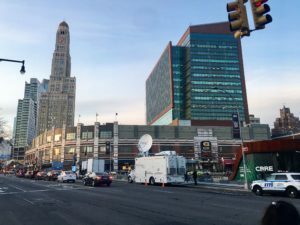 It’s WrestleMania time, and PSSI Global Services and WWE have taken over greater New York City for several days of big time wrestling action. The weekend’s kicking off with the NXT Takeover show at Barclays Center in Brooklyn. There we have Jim Flowers and Nick Ray in the CK25 mobile teleport providing multiple inbound and outbound pathways for domestic and international distribution. 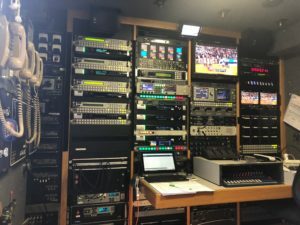 Strategic Television project manager Logan Schinto, who has spent months building transmission pathways for the worldwide distribution of all of WWE’s programming, is there with the crew to ensure the show goes off without a hitch. Nick, Jim, and Logan quickly shift gears after Friday night’s Takeover to broadcast the WWE Hall of Fame show on Saturday night, also at Barclays. Meanwhile, over at MetLife Stadium in East Rutherford, NJ, WWE stalwart Zane Michaels is working with Mike Sheehan to prepare the CK30 mobile teleport (loaded with additional fiber encoding equipment) for WrestleMania. Thank goodness we also have driver Joe Kelderhouse in the area, as he will shoot up to Brooklyn after the Hall of Fame show to bring the CK25 over to Metlife for the main event on Sunday night. 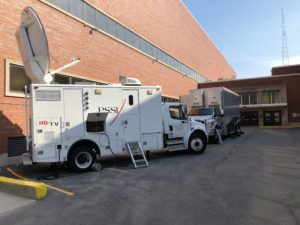 We also have a truck over at WWE headquarters in Stamford, CT, where Mike Howley will provide multiple uplink and downlink services to supplement the WWE facility, including a disaster recovery pathway for what is one of the largest shows in all of television. And don’t forget about the team over at the PSSI International Teleport, who will be a part of all the shows, providing QC and recording services, turnaround distributions via fiber and satellite, and much more. Our WWE team has left no stone unturned in developing a transmission and event management plan for what is, without question, one of the most complex and demanding live shows ever attempted. And as if all that weren’t enough, Joe, Zane, and Nick bring the CK30 up to Barclays for Monday night Raw and Tuesday night Smackdown before Joe heads to Canada for more stops on the never-ending WWE world tour. And that’s how we like it! Speaking of big shows, it’s time for the Final Four! 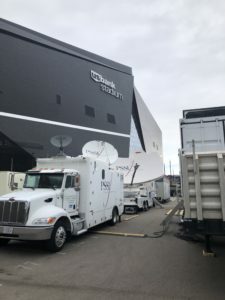 John May and Rick Ball have been testing and re-testing with CBS in the CK48 mobile teleport all week outside the US Bank Stadium in Minneapolis, MN. The weather hasn’t been as brutal as it could have been, but the guys are putting in long hours to get everything just right for this weekend’s games with Virginia, Texas Tech, Michigan State, and Auburn. Sunday’s a dark day, so John will get some well-deserved rest while Rick takes a quick trip to Vegas to accept an Emmy! That’s right, PSSI Global Services will be awarded a Technology and Engineering Emmy on Sunday night at a banquet hosted by the Academy of Television Arts and Sciences. Rick was key to PSSI being recognized by the Academy, and he wouldn’t miss it for the world. Nor would he miss the NCAA Championship, which is why he’s heading right back to Minnesota for Monday night’s game! Rick and John aren’t the only ones in Minneapolis. Rick Kolinek’s finishing up a great run through March Madness in the K22, providing CBS’s multiple platforms with press conferences, interviews, and game coverage throughout the weekend. PSSI News Group’s Steve Mills is in town for CNN, too! Believe it or not, that’s not all the basketball on our schedule! Justin Roszak and the NT33 truck are are Amalie Arena in Tampa, FL for the NCAA Women’s Final Four, where we have the Oregon Ducks taking on the Baylor Lady Bears and the UConn Huskies taking on Notre Dame to see who will play for the championship on Sunday. And a little high school hoops, too! Dennis Smith and the NT21 truck are at the Geico High School Basketball Nationals in Queens, NY through Saturday where the top 10 ranked high school girls and boys basketball teams compete for the title. Both the NT21 and NT33 are powerhouse Ku-band SNGs that PSSI Global Services has absorbed into the fleet through our partnership with CNN. 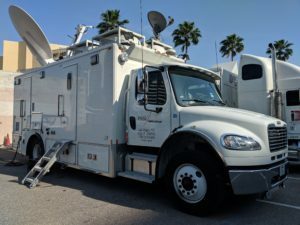 Our team in Orlando has modified and upgraded these trucks to meet the needs of our sports customers, while keeping all of the news capabilities intact. Paul Blomstrom’s in yet another upgraded NT truck in Vegas Friday night for Showtime. Paul’s all set up in NT31 at Sam’s Town Casino for Showtime’s Friday Fight Night, when Angelo Leo takes on Neil John Tabanao in 10 rounds of featherweight action in the main event. Not too far up the road from Paul, his brother Brian is parking the CK35 mobile teleport at the MGM Grand Garden Arena to prepare for Sunday’s 54th Annual Academy of Country Music Awards with host Reba McEntire. Brian and the CK35 are requested by name at all the major award shows, and we’re very pleased to be working with CBS yet again for this great event. Kevin Spangler and Craig Henry have already settled in for what’s going to be a long stretch of transmission services for the Masters in Augusta, GA. Kevin’s over at Augusta National for Golf Channel’s coverage of the Drive, Chip, and Putt competition, while Craig’s been set up at Augusta Country Club for Golf Channel’s “Live From the Masters” show. Kevin will join Craig as the days get longer, and our guys will tag team in and out of the truck through the final round on April 14. PSSI News Group’s Charlie Neiswenter is also there for CNN’s coverage of this prestigious event. Back west, Wes Hill’s finishing up a long stretch of work at the Mission Hills Country Club in Rancho Mirage, CA. Wes is providing multipath transmissions and comms services for Golf Channel News at the ANA Inspiration Tournament, one of the 5 major annual LPGA Championships. Then there’s soccer, lacrosse, and hockey! Big thanks to Rick Varney who took a late call from a fellow engineer suffering from a flu bug and hopped in the C45 at a moment’s notice for this Saturday’s MLS game between LAFC and DC United at Audi Field in Washington, DC. All of our engineers in the field – and the office staff, too – are always willing to help their colleagues and ensure none of our customers miss a beat. Dave Mitchell and the Arizona truck have rotated over to Milwaukee from Pittsburgh to cover some AHL hockey while Rick Kolinek’s at the Final Four. Mitch will be at the University of Wisconsin-Milwaukee’s Panther Arena on Saturday, when the Chicago Wolves take on the Milwaukee Admirals. Dave Buckman and the Columbia truck will be at Ridley Athletic Center in Baltimore, MD for NCAA lacrosse, as the Loyola Greyhounds face the Lehigh University Mountain Hawks. Todd Harvey and the NT30 truck will be at Peter Barton Lacrosse Stadium in Denver, CO for more NCAA lacrosse when the Villanova University Wildcats take on the University of Denver Pioneers. We have a big racing weekend across the country. Joe Cox and Ben Bradshaw have been at the Las Vegas Motor Speedway all week working alongside our friends at NHRA and AT&T to provide fiber distribution of all the NHRA racing action through the weekend. Our west coast-based C15 truck is now fully equipped with a Media Links shelf, which means it can serve as a mobile point-of-presence (POP) anywhere there’s AT&T fiber. Featuring a 5.5m antenna and solid state amplifiers, the truck is a multi-platform transmission powerhouse, capable of providing satellite, IP, and fiber distribution in any and all possible combinations. The C27 mobile teleport is another such transmission vehicle, capable of providing multi-path, multi-platform transmissions for our demanding friends at NASCAR. Jonathan Ayala and Steve Toth are at the helm of the C27at Bristol Motor Speedway this week for the Alsco 300 and the Zombie Auto 150 on Saturday, and the Monster Energy NASCAR Cup Series 2019 Food City 500 on Sunday afternoon. 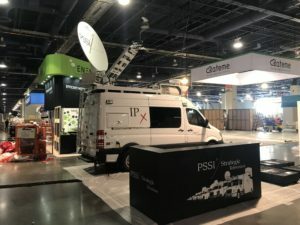 Here again PSSI International Teleport and its extensive AT&T fiber connectivity play a pivotal role in delivering multiple feeds in and out of the track and NASCAR headquarters. Still more racing in the Northeast. Mike Lemieux and the Wolfcoach truck will be at Thompson Speedway in Thompson, CT on Saturday for the 2019 Icebreaker Weekend, the first event of the short track season in New England. The guys at PIT will take in Mike’s feed and pass it along to NASCAR headquarters in Charlotte via AT&T Global Video services fiber. Hear more about our exciting partnerships with AT&T, Nextologies, and Eutelsat – as well as all the other exciting stuff we’re doing – at our booth during next week’s NAB Show. We’ll have one of these multi-platform transmission vehicles parked right there in our booth (#SU5802), and we’d love to see you there!